Akhmad Abdulkhamidovich Kadyrov (Russian: Ахмат Абдулхамидович Кадыров; Chechen: Къадири lабдулхьамидан кlант Ахьмад-Хьажи / Q̇adiri Jabdulẋamidan khant Aẋmad-Ẋaƶi; 23 August 1951 – 9 May 2004), also spelled Akhmat, was the Chief Mufti of the Chechen Republic of Ichkeria in the 1990s during and after the First Chechen War. 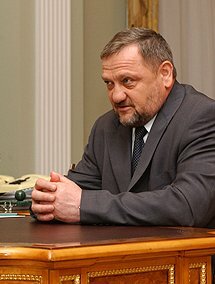 At the outbreak of the Second Chechen War he switched sides, offering his service to the Russian government, and later became the President of the Chechen Republic from 5 October 2003, acting as head of administration since July 2000. On 9 May 2004, he was assassinated by Chechen Islamists in Grozny, using a bomb blast during a World War II memorial victory parade. His son, Ramzan Kadyrov, who led his father's militia, became one of his successors in March 2007 as the President of the Chechen Republic. Akhmad (or Akhmat) Abdulkhamidovich Kadyrov was born in Karaganda in the Kazakh Soviet Socialist Republic on 23 August 1951 to a Chechen family that had been expelled from Chechnya during the Stalinist repressions. In April 1957, his family returned to Shalinsky District of the Chechen-Ingush ASSR. In 1980, he started studying Islam at Mir-i Arab Madrasah in Bukhara, and followed by studying at Islamic University in Tashkent, Uzbekistan, from 1982 to 1986. In the early 1990s, he returned to Chechnya, and founded the Islam Institute in the village of Kurchaloy. Following the Chechen declaration of independence, he became a supporter of separatist president Dzhokhar Dudayev. Kadyrov fought prominently in the First Chechen War on the Chechen side as a militia commander. In 1995, he was appointed Chief Mufti of Chechen Republic of Ichkeria. Following the outbreak of violence between Moscow and Chechen separatists, Kadyrov declared that "Russians outnumber Chechens in many times, thus every Chechen would have to kill 150 Russians." While the first war was mainly fought for nationalism, after the de facto independence of Ichkeria, much of the Chechen forces in the second war were jihadis, such as the Arab Mujahideen in Chechnya. Kadyrov, as Chief Mufti, was critical of Wahhabism, to which many of the foreign fighters adhered. Early in 1999 he gave a speech before the armed militia telling them that the nation was behind them, that the recent outbreak of violence was the fault of Christian and foreign involvement, and that they should continue on fighting with persistence and trust. But by the autumn of 1999, Kadyrov – a leading figure in the resistance movement – decided to abandon the insurgency and offered his support to Russian federal forces in Second Chechen War. Maskhadov immediately fired him from the Chief Mufti chair, although this decree was never accepted by Kadyrov, who abdicated himself a few months later due to his civilian chairman career. According to James Hughes, Kadyrov's U-turn may have been motivated partly by personal ambition and partly by a concern with the desperate condition of the Chechen population, and was also driven by a fear of the growing sectarian Wahhabi influence on the insurgency. After the Russian forces seized control over Chechnya in July 2000, Kadyrov was appointed acting head of the administration by the Russian president Vladimir Putin. On 5 October 2003, he was elected the first President of Chechnya. In this position, he remained mainly pro-Moscow. He also advocated numerous amnesty campaigns for former rebel fighters, who were allowed to join Chechen police and loyalist militia forces if they surrendered. His chief personal bodyguard was Movladi Baisarov. Reportedly, there were at least a dozen assassination attempts against him before the final one. On 9 May 2004, an explosion ripped through the VIP seating at the Dinamo football stadium during a mid-morning Soviet Victory Day parade in the capital city of Grozny, instantly killing Akhmad Kadyrov. Two of his bodyguards, the Chairman of the Chechen State Council, a Reuters journalist, and as many as a dozen others were also killed (a later report stated that more than 30 people had died). Some 56 others were wounded, including Colonel General Valery Baranov, the commander of Russian forces in Chechnya, who lost a leg in the explosion. The bomb was said to have been built into the concrete of a supporting column during recent repairs. The Islamist Chechen rebel leader Shamil Basayev later claimed that he had paid $50,000 for the attack. Akhmad Kadyrov had four children, two daughters (Zargan and Zulay) and two sons. The older son, Zelimkhan Kadyrov, died on 31 May 2004. The younger son, Ramzan Kadyrov, led his father's militia and was appointed prime minister and president of Chechnya in March 2007. The Akhmad Kadyrov Mosque in Grozny is named for him. On 7 June 2017, the football club Terek Grozny was renamed to Akhmat Grozny, after Akhmad Kadyrov. ^ Liz Fuller; Aslan Doukaev (December 2007). 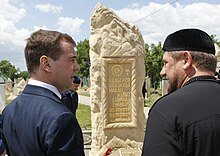 "Chechnya: Kadyrov Uses 'Folk Islam' For Political Gain". Radio Free Europe/Radio Liberty. ^ Bowker, Mike (2005). "Western Views of the Chechen Conflict". In Richard Sakwa (ed.). Chechnya: From Past to Future (1st ed.). London: Anthem Press. pp. 223–38. ISBN 978-1-84331-164-5. ^ Hughes, James (2005). "The Peace Process in Chechnya". In Richard Sakwa (ed.). Chechnya: From Past to Future (1st ed.). London: Anthem Press. pp. 265–288. ISBN 978-1-84331-164-5. ^ "$50,000 Bounty in Chechen Blood Feud". The New York Times. 17 June 2006. Wikimedia Commons has media related to Akhmad Kadyrov.